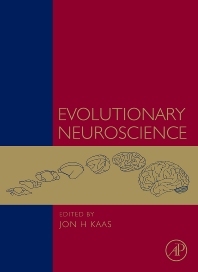 Evolutionary Neuroscience is a collection of articles in brain evolution selected from the recent comprehensive reference, Evolution of Nervous Systems (Elsevier, Academic Press, 2007). The selected chapters cover a broad range of topics from historical theory to the most recent deductions from comparative studies of brains. The articles are organized in sections focused on theories and brain scaling, the evolution of brains from early vertebrates to present-day fishes, amphibians, reptiles and birds, the evolution of mammalian brains, and the evolution of primate brains, including human brains. Each chapter is written by a leader or leaders in the field, and has been reviewed by other experts. Specific topics include brain character reconstruction, principles of brain scaling, basic features of vertebrate brains, the evolution of the major sensory systems, and other parts of brains, what we can learn from fossils, the origin of neocortex, and the evolution of specializations of human brains. The collection of articles will be interesting to anyone who is curious about how brains evolved from the simpler nervous systems of the first vertebrates into the many different complex forms now found in present-day vertebrates. This book would be of use to students at the graduate or undergraduate levels, as well as professional neuroscientists, cognitive scientists, and psychologists. Together, the chapters provide a comprehensive list of further reading and references for those who want to inquire further. Comparative neuroanatomists, biologists and neuroscientists, post graduates. Jon H. Kaas is currently Distinguished Centennial Professor of Psychology at Vanderbilt University. He received his PhD training in comparative studies of forebrain organization in mammals in the laboratory of I. T. Diamond at Duke University, and postdoctoral training studying cortical organization in the comparative neurophysiology laboratory of C. N. Woolsey at the University of Wisconsin. His research has focused on determining the organizations of sensory and motor systems in mammals, especially in primates, with an effort to understand the evolution of the forebrain from early mammals to present-day humans. He has published over 250 research papers and 150 reviews. He is an elected member of the National Academy of Sciences, and of the American Academy of Arts and Sciences. He is also a member of the La Jolla Group for Explaining the Origin of Humans.